Arms you with powerful tools for overcoming resistance to change and creating a culture of collaboration, engagement, and employee empowerment Your people are your most valuable asset, and if you want them to excel (and your profits to soar), you'll need to abandon your traditional command-and-control management style and adopt a collaborative, open leadership approach—one that engages and empowers your people. While this isn't a particularly new idea, many leaders, while they may pay lip service to it, don't really understand what it means. And most of those who do get it lack the skills for putting it into practice. In Flat Army you'll find powerful leadership models and tools that help you challenge yourself and overcome your personal obstacles to change, while pushing the boundaries of organizational change to create a culture of collaboration. 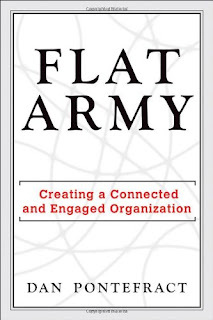 I am continually working to engage my kids in many ways, but I cannot way that I am an expert, in Flat Army: Creating a Connected and Engaged Community the author works to build a definition of an engaged employee and how to get to that point in your own organization. The nice things about this book are the examples that are given and in the fact that the book focuses on re-engaging employees that may have disengaged from the organization in some way. 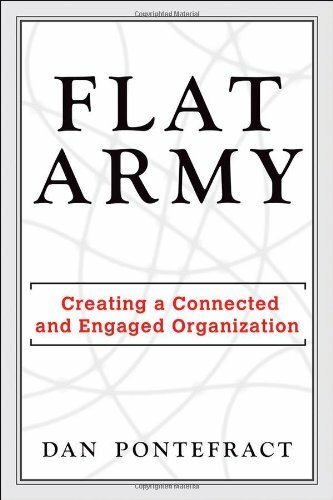 The whole concept of building a flat army that is working to build a culture that supports productive engagement at all levels of the organization. I also love that the author is talking about the important of building leadership at all levels, thus creating a flat organization! The book is practical and you will truly learn so much in every chapter of this book, or at least I know that I did!